Can I take a lease car outside the UK? 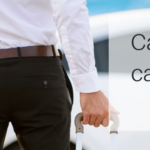 Going abroad with your lease car? Here's everything you need to know. Planning a trip abroad for business or pleasure? If you're considering driving outside of the UK in your lease vehicle then there are a few things you need to know. While you can take a lease car outside of the UK it is at the discretion of your finance house. Not only that, there is some paperwork that will be required before you go too. When taking a UK leased vehicle to Europe you will need to obtain the appropriate paperwork to do so. This is a VE1O3 certificate and a VE103B certificate. A VE103B certificate is designed to replace the original vehicle documentation when travelling abroad. A lease car driver does not possess the vehicle log book and so must obtain a VE103B certificate before travelling to prove they have permission to drive the vehicle. The VE103 certificate is designed to provide proof that they can take the vehicle outside of the UK. The driver must also carry both the VE103 and the VE103B certificate with them throughout their journey.